This article is about the air purifier. For the controversial psychiatric treatment, see Negative air ionization therapy. An air ioniser (or negative ion generator or Chizhevsky's chandelier) is a device that uses high voltage to ionise (electrically charge) air molecules. Negative ions, or anions, are particles with one or more extra electron, conferring a net negative charge to the particle. Cations are positive ions missing one or more electrons, resulting in a net positive charge. Some commercial air purifiers are designed to generate negative ions. Another type of air ioniser is the electrostatic discharge (ESD) ioniser (balanced ion generator) used to neutralise static charge. In 2002, in an obituary in The Independent newspaper, Cecil Alfred 'Coppy' Laws was credited with being the inventor of the domestic air ioniser. Air ionisers have been used to eliminate the occurrence of air-borne bacterial infections and to reduce static electricity buildup in electronics. Air ionisers are used in air purifiers to remove particles from air. Airborne particles become charged as they attract charged ions from the ioniser by electrostatic attraction. The particles in turn are then attracted to any nearby earthed (grounded) conductors, either deliberate plates within an air cleaner, or simply the nearest walls and ceilings. The frequency of nosocomial infections in British hospitals prompted the National Health Service (NHS) to research the effectiveness of anions for air purification, finding that repeated airborne acinetobacter infections in a ward were eliminated by the installation of a negative air ioniser—the infection rate fell to zero, an unexpected result. Positive and negative ions produced by air conditioning systems have also been found by a manufacturer to inactivate viruses including influenza. However, a 2013 comprehensive review of 80 years of research into air ions and respiratory function outcomes found that there was no clear support for any beneficial role in respiratory function, nor evidence for significant detrimental effect. In conclusion, "exposure to negative or positive air ions does not appear to play an appreciable role in respiratory function." The SARS epidemic fueled the desire for personal ionisers in East Asia, including Japan (where many products have been specialised to contain negative ion generators, including toothbrushes, refrigerators, air conditioners, air cleaners, and washing machines). There are no specific standards for these devices. 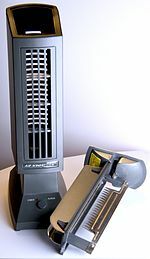 There are two types of Ionic Air Purifiers, The fanless and fan base ionizers. The fan base Ionizers uses its fan to circulate air around the room rapidly but it is noisier and consumes more energy, while the fanless types distribute air slowly hence take a longer time to purify air but are noiseless and energy efficient. Ionisers are distinct from ozone generators, although both devices operate in a similar way. Ionisers use electrostatically charged plates to produce positively or negatively charged gas ions (for instance N2− or O2−) that particulate matter sticks to in an effect similar to static electricity. Even the best ionisers will also produce a small amount of ozone—triatomic oxygen, O3—which is unwanted. Ozone generators are optimised to attract an extra oxygen ion to an O2 molecule, using either a corona discharge tube or UV light. At concentrations that do not exceed public health standards, ozone has been found to have little potential to remove indoor air contaminants. At high concentrations ozone can be toxic to air-borne bacteria, and may destroy or kill these sometimes infectious organisms. However, the required concentrations are sufficiently toxic to humans and animals that the US FDA declares that ozone has no place in medical treatment and has taken action against businesses that violate this regulation by offering therapeutic ozone generators or ozone therapy. Ozone is a highly toxic and extremely reactive gas. A higher daily average than 0.1 ppm (100 ppb, 0.2 mg/m³) is not recommended and can damage the lungs and olfactory bulb cells directly. A number of studies have been carried out on negative ion generators. A study shows that the ozone generated can exceed guidelines in small, non ventilated areas. One study showed that ozone can react with other constituents, namely cleaning agents to increase pollutants such as formaldehyde (importantly, this study had as its objective the testing of the use of cleaning products and air fresheners indoors and associated health risks as opposed to adverse health effects of air ionisers). The United States District Court for the Northern District of California dismissed the case, reasoning that The Sharper Image had failed to demonstrate that it could prove any of the statements made by Consumer Reports were false. The Court's final ruling in May 2005 ordered The Sharper Image to pay US$525,000 for Consumer Union's legal expenses. Air ionisers are often used in places where work is done involving static-electricity-sensitive electronic components, to eliminate the build-up of static charges on non-conductors. As those elements are very sensitive to electricity, they cannot be grounded because the discharge will destroy them as well. Usually, the work is done over a special dissipative table mat, which allows a very slow discharge, and under the air gush of an ioniser. ^ Shiue, Angus (2011). "Particles Removal by Negative ionic Air Purifier in Cleanroom". Aerosol and Air Quality Research. 11 (2): 179–186. doi:10.4209/aaqr.2010.06.0048. ^ McDowell, Natasha (3 January 2003). "Air ionisers wipe out hospital infections". The New Scientist (Daily news). Retrieved 24 August 2016. ^ Alexander, D. D.; Bailey, W. H.; Perez, V.; Mitchell, M. E.; Su, S. (2013). "Air ions and respiratory function outcomes: a comprehensive review". Journal of Negative Results in Biomedicine. 12: 14. doi:10.1186/1477-5751-12-14. PMC 3848581. PMID 24016271. ^ Thiemens, Mark H.; Jackson, Teresa (1987-06-01). "Production of isotopically heavy ozone by ultraviolet light photolysis of O2". Geophysical Research Letters. 14 (6): 624–627. doi:10.1029/GL014i006p00624. ISSN 1944-8007. ^ Woolston, Chris (21 April 2008). "Ionic purifiers' dirty secret". Los Angeles Times (THE HEALTHY SKEPTIC). Retrieved 24 August 2016. ^ "CFR – Code of Federal Regulations Title 21". www.accessdata.fda.gov. Retrieved 2017-04-26. ^ Kurtzweil P (1999). "Ozone generators generate prison terms for couple". FDA Consum. 33 (6): 36–7. PMID 10628316. ^ "Occupational Health Guideline for Ozone" (PDF). Centers for Disease Control and Prevention. ^ "Quantification of Ozone Levels in Indoor Environments Generated by Ionization and Ozonolysis Air Purifiers" (PDF). Air & Waste Manage. Assoc. 56:601–610. May 2006. Look up ioniser in Wiktionary, the free dictionary. Fletcher, L.A.; Noakes, C.J. ; Sleigh, P.A. ; Beggs, C.B. ; Shepherd, S.J. (1 April 2008). "Air Ion Behavior in Ventilated Rooms" (PDF). Indoor and Built Environment. 17 (2): 173–182. doi:10.1177/1420326X08089622. This page was last edited on 14 March 2019, at 23:07 (UTC).